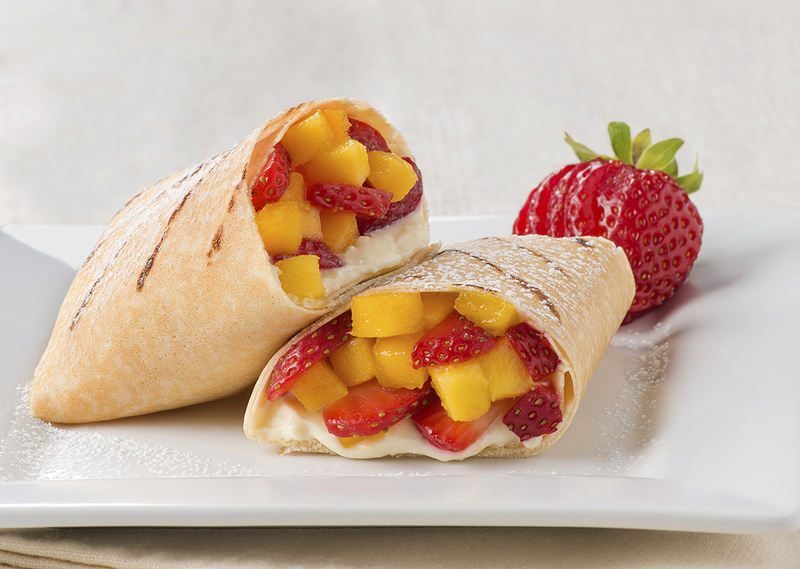 Store bought crepes make this sweet dessert burrito a snap to make. The rich creamy filling is flavored with orange zest for a fresh and lively filling. Stir cream cheese with yogurt, orange zest and icing sugar until combined. Preheat your George Foreman Grill for 5 minutes with the lid closed. Meanwhile, stack 2 crepes on clean work surface. Spread some of cream cheese mixture down the center of crepe stack, leaving a small border on each end. Place some sliced strawberries and mangoes on top. Fold bottom of the crepe stack over the filling then fold in the sides. Place on grill seam side down and cook for approximately 2 minutes or until crepe is golden and filling is heated through. Place on serving plate and dust with icing sugar. Tip: Substitute bananas for the mango, if desired.